You are currently browsing the tag archive for the ‘Schrodinger equation’ tag. As an “extra challenge” posed in an exercise in one of my books (Exercise 2.28, to be precise), I asked the reader to use the embeddings (or more generally ) to explicitly connect together the pseudoconformal transformation and the conformal transformation . It turns out that this connection is a little bit unusual, with the “obvious” guess (namely, that the embeddings intertwine and ) being incorrect, and as such this particular task was perhaps too difficult even for a challenge question. I’ve been asked a couple times to provide the connection more explicitly, so I will do so below the fold. It is an important fact in analysis that many of these above assertions extend to operators on an infinite-dimensional Hilbert space , so long as one one is careful about what “self-adjoint operator” means; these facts are collectively referred to as the spectral theorem. For instance, it turns out that most of the above claims have analogues for bounded self-adjoint operators . However, in the theory of partial differential equations, one often needs to apply the spectral theorem to unbounded, densely defined linear operators , which (initially, at least), are only defined on a dense subspace of the Hilbert space . A very typical situation arises when is the square-integrable functions on some domain or manifold (which may have a boundary or be otherwise “incomplete”), and are the smooth compactly supported functions on , and is some linear differential operator. It is then of interest to obtain the spectral theorem for such operators, so that one build operators such as or to solve equations such as (1), (2), (3), (4). for all test functions , as can be seen from a routine integration by parts. As such, the resolvent map is not everywhere uniquely defined. There is also a lack of uniqueness for the wave, heat, and Schrödinger equations for this operator (note that there are no spatial boundary conditions specified in these equations). for all test functions (note that the function lies in when is in the lower half-plane). For related reasons, the translation operators have a problem with either uniqueness or existence (depending on whether is positive or negative), due to the unspecified boundary behaviour at the origin. The key property that lets one avoid this bad behaviour is that of essential self-adjointness. Once is essentially self-adjoint, then spectral theorem becomes applicable again, leading to all the expected behaviour (e.g. existence and uniqueness for the various PDE given above). Existence of a “reasonable” functional calculus. Unitary equivalence with a multiplication operator. Thus, to actually verify essential self-adjointness of a differential operator, one typically has to first solve a PDE (such as the wave, Schrödinger, heat, or Helmholtz equation) by some non-spectral method (e.g. by a contraction mapping argument, or a perturbation argument based on an operator already known to be essentially self-adjoint). Once one can solve one of the PDEs, then one can apply one of the known converse spectral theorems to obtain essential self-adjointness, and then by the forward spectral theorem one can then solve all the other PDEs as well. But there is no getting out of that first step, which requires some input (typically of an ODE, PDE, or geometric nature) that is external to what abstract spectral theory can provide. For instance, if one wants to establish essential self-adjointness of the Laplace-Beltrami operator on a smooth Riemannian manifold (using as the domain space), it turns out (under reasonable regularity hypotheses) that essential self-adjointness is equivalent to geodesic completeness of the manifold, which is a global ODE condition rather than a local one: one needs geodesics to continue indefinitely in order to be able to (unitarily) solve PDEs such as the wave equation, which in turn leads to essential self-adjointness. (Note that the domains and in the previous examples were not geodesically complete.) For this reason, essential self-adjointness of a differential operator is sometimes referred to as quantum completeness (with the completeness of the associated Hamilton-Jacobi flow then being the analogous classical completeness). In these notes, I wanted to record (mostly for my own benefit) the forward and converse spectral theorems, and to verify essential self-adjointness of the Laplace-Beltrami operator on geodesically complete manifolds. This is extremely standard analysis (covered, for instance, in the texts of Reed and Simon), but I wanted to write it down myself to make sure that I really understood this foundational material properly. Vector space duality A vector space over a field can be described either by the set of vectors inside , or dually by the set of linear functionals from to the field (or equivalently, the set of vectors inside the dual space ). (If one is working in the category of topological vector spaces, one would work instead with continuous linear functionals; and so forth.) A fundamental connection between the two is given by the Hahn-Banach theorem (and its relatives). Vector subspace duality In a similar spirit, a subspace of can be described either by listing a basis or a spanning set, or dually by a list of linear functionals that cut out that subspace (i.e. a spanning set for the orthogonal complement . Again, the Hahn-Banach theorem provides a fundamental connection between the two perspectives. 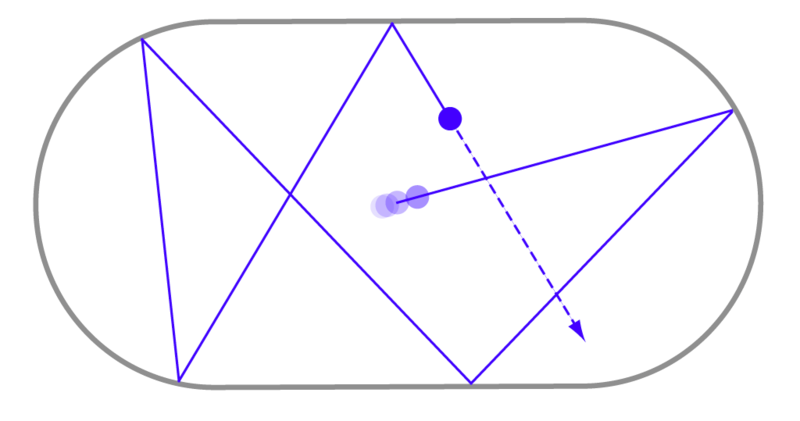 Convex duality More generally, a (closed, bounded) convex body in a vector space can be described either by listing a set of (extreme) points whose convex hull is , or else by listing a set of (irreducible) linear inequalities that cut out . The fundamental connection between the two is given by the Farkas lemma. Ideal-variety duality In a slightly different direction, an algebraic variety in an affine space can be viewed either “in physical space” or “internally” as a collection of points in , or else “in frequency space” or “externally” as a collection of polynomials on whose simultaneous zero locus cuts out . The fundamental connection between the two perspectives is given by the nullstellensatz, which then leads to many of the basic fundamental theorems in classical algebraic geometry. Hilbert space duality An element in a Hilbert space can either be thought of in physical space as a vector in that space, or in momentum space as a covector on that space. The fundamental connection between the two is given by the Riesz representation theorem for Hilbert spaces. Semantic-syntactic duality Much more generally still, a mathematical theory can either be described internally or syntactically via its axioms and theorems, or externally or semantically via its models. The fundamental connection between the two perspectives is given by the Gödel completeness theorem. Intrinsic-extrinsic duality A (Riemannian) manifold can either be viewed intrinsically (using only concepts that do not require an ambient space, such as the Levi-Civita connection), or extrinsically, for instance as the level set of some defining function in an ambient space. Some important connections between the two perspectives includes the Nash embedding theorem and the theorema egregium. Group duality A group can be described either via presentations (lists of generators, together with relations between them) or representations (realisations of that group in some more concrete group of transformations). A fundamental connection between the two is Cayley’s theorem. Unfortunately, in general it is difficult to build upon this connection (except in special cases, such as the abelian case), and one cannot always pass effortlessly from one perspective to the other. Pontryagin group duality A (locally compact Hausdorff) abelian group can be described either by listing its elements , or by listing the characters (i.e. continuous homomorphisms from to the unit circle, or equivalently elements of ). The connection between the two is the focus of abstract harmonic analysis. Pontryagin subgroup duality A subgroup of a locally compact abelian group can be described either by generators in , or generators in the orthogonal complement . One of the fundamental connections between the two is the Poisson summation formula. Fourier duality A (sufficiently nice) function on a locally compact abelian group (equipped with a Haar measure ) can either be described in physical space (by its values at each element of ) or in frequency space (by the values at elements of the Pontryagin dual ). The fundamental connection between the two is the Fourier inversion formula. Stone/Gelfand duality A (locally compact Hausdorff) topological space can be viewed in physical space (as a collection of points), or dually, via the algebra of continuous complex-valued functions on that space, or (in the case when is compact and totally disconnected) via the boolean algebra of clopen sets (or equivalently, the idempotents of ). The fundamental connection between the two is given by the Stone representation theorem or the (commutative) Gelfand-Naimark theorem. A function which is band-limited (restricted to low frequencies) is featureless and smooth at fine scales, but can be oscillatory (i.e. containing plenty of cancellation) at coarse scales. Conversely, a function which is smooth at fine scales will be almost entirely restricted to low frequencies. A function which is restricted to high frequencies is oscillatory at fine scales, but is negligible at coarse scales. Conversely, a function which is oscillatory at fine scales will be almost entirely restricted to high frequencies. Projecting a function to low frequencies corresponds to averaging out (or spreading out) that function at fine scales, leaving only the coarse scale behaviour. Projecting a frequency to high frequencies corresponds to removing the averaged coarse scale behaviour, leaving only the fine scale oscillation. The number of degrees of freedom of a function is bounded by the product of its spatial uncertainty and its frequency uncertainty (or more generally, by the volume of the phase space uncertainty). In particular, there are not enough degrees of freedom for a non-trivial function to be simulatenously localised to both very fine scales and very low frequencies. To control the coarse scale (or global) averaged behaviour of a function, one essentially only needs to know the low frequency components of the function (and vice versa). To control the fine scale (or local) oscillation of a function, one only needs to know the high frequency components of the function (and vice versa). Localising a function to a region of physical space will cause its Fourier transform (or inverse Fourier transform) to resemble a plane wave on every dual region of frequency space. Averaging a function along certain spatial directions or at certain scales will cause the Fourier transform to become localised to the dual directions and scales. The smoother the averaging, the sharper the localisation. The smoother a function is, the more rapidly decreasing its Fourier transform (or inverse Fourier transform) is (and vice versa). If a function is smooth or almost constant in certain directions or at certain scales, then its Fourier transform (or inverse Fourier transform) will decay away from the dual directions or beyond the dual scales. If a function has a singularity spanning certain directions or certain scales, then its Fourier transform (or inverse Fourier transform) will decay slowly along the dual directions or within the dual scales. Localisation operations in position approximately commute with localisation operations in frequency so long as the product of the spatial uncertainty and the frequency uncertainty is significantly larger than one. In the high frequency (or large scale) limit, position and frequency asymptotically behave like a pair of classical observables, and partial differential equations asymptotically behave like classical ordinary differential equations. At lower frequencies (or finer scales), the former becomes a “quantum mechanical perturbation” of the latter, with the strength of the quantum effects increasing as one moves to increasingly lower frequencies and finer spatial scales. I think of all of the above (closely related) assertions as being instances of “the uncertainty principle”, but it seems difficult to combine them all into a single unified assertion, even at the heuristic level; they seem to be better arranged as a cloud of tightly interconnected assertions, each of which is reinforced by several of the others. The famous inequality is at the centre of this cloud, but is by no means the only aspect of it. The uncertainty principle (as interpreted in the above broad sense) is one of the most fundamental principles in harmonic analysis (and more specifically, to the subfield of time-frequency analysis), second only to the Fourier inversion formula (and more generally, Plancherel’s theorem) in importance; understanding this principle is a key piece of intuition in the subject that one has to internalise before one can really get to grips with this subject (and also with closely related subjects, such as semi-classical analysis and microlocal analysis). Like many fundamental results in mathematics, the principle is not actually that difficult to understand, once one sees how it works; and when one needs to use it rigorously, it is usually not too difficult to improvise a suitable formalisation of the principle for the occasion. But, given how vague this principle is, it is difficult to present this principle in a traditional “theorem-proof-remark” manner. Even in the more informal format of a blog post, I was surprised by how challenging it was to describe my own understanding of this piece of mathematics in a linear fashion, despite (or perhaps because of) it being one of the most central and basic conceptual tools in my own personal mathematical toolbox. In the end, I chose to give below a cloud of interrelated discussions about this principle rather than a linear development of the theory, as this seemed to more closely align with the nature of this principle. I recently attended a talk by Natasa Pavlovic on the rigorous derivation of this type of limiting behaviour, which was initiated by the pioneering work of Hepp and Spohn, and has now attracted a vast recent literature. The rigorous details here are rather sophisticated; but the heuristic explanation of the phenomenon is fairly simple, and actually rather pretty in my opinion, involving the foundational quantum mechanics of -particle systems. I am recording this heuristic derivation here, partly for my own benefit, but perhaps it will be of interest to some readers. This discussion will be purely formal, in the sense that (important) analytic issues such as differentiability, existence and uniqueness, etc. will be largely ignored. As I said before, I will try to link to at least one other PCM article in every post in this series. Today I would like to highlight Madhu Sudan‘s delightful article on information and coding theory, “Reliable transmission of information“. In this paper we obtain the same result for the defocusing two-dimensional mass-critical NLS , as well as in the focusing case under the additional assumption that the mass of the initial data is strictly less than the mass of the ground state. (When mass equals that of the ground state, there is an explicit example, built using the pseudoconformal transformation, which shows that solutions can blow up in finite time.) In fact we can show a slightly stronger statement: for spherically symmetric focusing solutions with arbitrary mass, we can show that the first singularity that forms concentrates at least as much mass as the ground state.